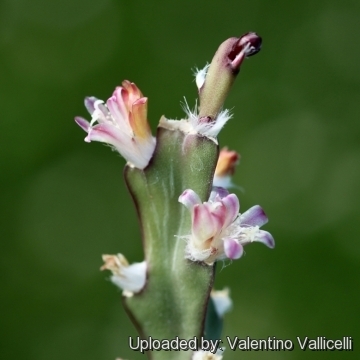 Accepted Scientific Name: Lepismium cruciforme (Vell.) Miq. Origin and Habitat: Lepismium cruciforme is common in southeastern and southern Brazil (Bahia, Espírito Santo, Goiás, Mato Grosso, Mato Grosso do Sul, Minas Gerais, Paraná, Pernambuco, Rio de Janeiro, Rio Grande do Sul, Santa Catarina, São Paulo, Tocantins), southeastern Paraguay and northeastern Argentina (Corrientes, Santa Fé). Altitude range: This cactus occurs from sea level to 1,200 metres above sea level. 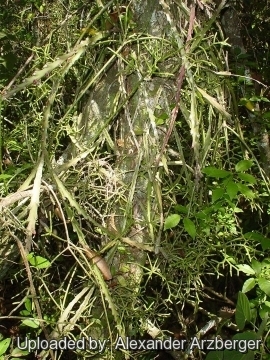 Habitat and Ecology: Lepismium cruciforme is a disjunct humid forest element that grows as an epiphyte or lithophyte in the Atlantic forest, including mata de brejo (NE Brazil) and restinga. It is an extremely variable species, with individuals from different parts of the range looking very different from each other. Although there has been decline in part of its range, Lepismium cruciforme is still very widespread and sufficiently common. In the north, in the Atlantic forest, there is considerable habitat loss due to deforestation for expanding agriculture (sugar cane) and expanding urbanization. Lepismium cruciforme var. cavernosum (G.Lindb.) Backeb. Rhipsalis cavernosa G.Lindb. ex K.Schum. Lepismium cruciforme subvar. vollii (Backeb.) Backeb. Lepismium cruciforme var. myosurus (Salm-Dyck) Backeb. Rhipsalis ramosissima (Lem.) K.Schum. in Mart. Cactus tenuis Schott ex DC. Rhipsalis macropogon K.Schum. in Mart. Description: Lepismium cruciforme is a saxicolous or epiphytic cactus semierect or creeping over rocks. The stems segments of which freely rooting, appressed, somewhat branching and turning magenta in summer given adequate light. Plants produce diminutive white or pink flowers followed by beadlike, purple-pink fruit. Lepismium cruciforme is variable and a number of varieties have been proposed. Branches (stems segments): Foliaceous (leaf-like), extremely variable, sometimes 3, 4, or even 5-angled, or flat, linear-lanceolate, to 50 cm long, 2 cm broad, more or less winged, narrowed at base, more or less purplish, especially on edges. Margins distinctly notched. Areoles: Subtended by miniscule scales,sunken in the crenation in the margins, with tufts of white wool. Spines: Absent or nearly so. Flowers: Borne laterally 2 to 5 or even more from an areole. White, cream, yellow, pink, or rarely magenta, reddish-brown on the uotside, 10 to 13 mm Long. Perianth-segments united at base into a short tube. Filaments slender, adnate to flower-tube. Stigma-lobes 4 or 5. Fruit: Globular, juicy, purplish to red, smooth, turgid, translucent, 6 to 12 mm in diameter. Seeds: Light brown to black, 1.8 mm long. 2) Taylor, N.P., Zappi, D., Machado, M. & Braun, P. 2013. Lepismium cruciforme. The IUCN Red List of Threatened Species. Version 2014.3. <www.iucnredlist.org>. Downloaded on 03 May 2015. 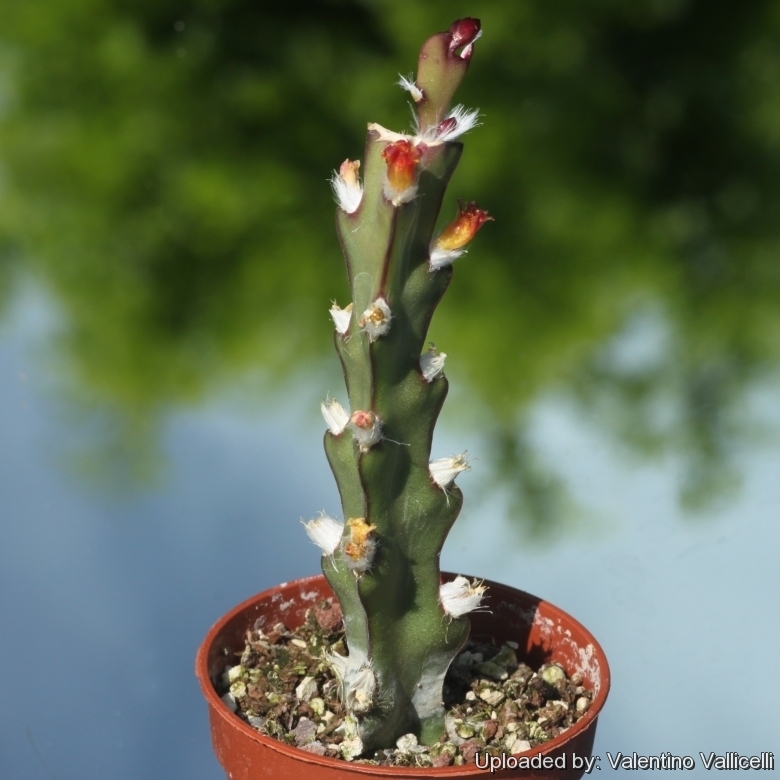 Cultivation and Propagation: Lepismium cruciforme is among the easiest to cultivate epiphytic cacti and tolerates neglect. These forest cacti tend to be long lived. This cactus is olive green under ideal growing conditions but blushes magenta when stressed. Give it more heat or cold, less water or fewer nutrients, and you'll get that beautiful hue. Exposure: This plant prefers dappled shade. Watering: It requires ample water (more than other cacti) during spring and fall, but allow soil to dry slightly between waterings. Then stress the plant in winter and summer to encourage it to redden. Mist it occasionally, year-round, unless you live where humidity is high. Soil: These cacti won't want a normal cactus soil but will prefer to be in a soil largely composed of organic material, such as peat or sphagnum moss. This type of soil would normally be used for orchids, bromeliads or other epiphytic plants. Regular potting soil is also fine as long as it drains well. Fertilization: It will want occasional doses of dilute fertilizer. Hardiness: Lepismium cruciforme is not frost-hardy and won't tolerate desert heat, but it thrives in coastal gardens. It needs night-time temperatures no cooler than 5° C, especially in the winter. In summer it need warm but not hot temperatures, preferably under 27° C.
Uses: Grow lepismium in a flat-backed pot against a light-colored wall to show off the plant's striking color and spider-like explosion of scalloped leaves. Or use it as a cascading element of a potted composition with other succulents. These forest cacti tend to be long lived. Special requirements: These plants bloom profusely if grown in an even, high temperature, but significantly less if the temperature fluctuates between 4°C and 18°C. They drop their buds easily if they are moved. Once flower buds have formed, do not move the plant, as slight changes in environment may cause the buds to drop. Propagation: Stem cuttings. This plant can also be propagated from seed.